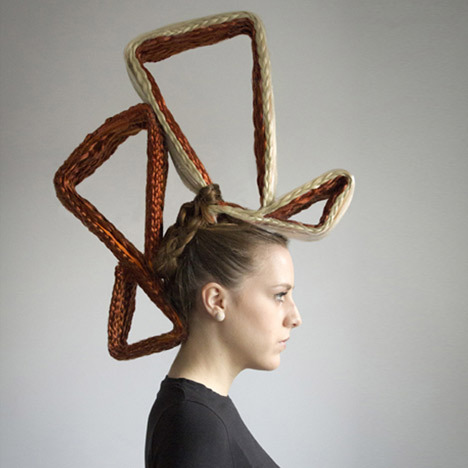 Portuguese architects and hairdressers have collaborated on these coiffures inspired by architectural structures. Hairdresser Gijo challenged FAHR 021.3, a group of Portuguese architects working in Berlin, to bring their ideas and methods into his salon. The resulting hairdos are inspired by the architectural and fashion styles of the '60s and '70s. A group of architects and a renowned hairdresser join together with a common goal, sharing the joy of creation and interaction with the public. Inspired by his work experience in New York, Gijo challenged different architects on designing a Haircut line. After few contacts he found FAHR 021.3, group of portuguese architects working at that time in Berlin, an open experimental field. Motivated by the European Capital of Culture in Guimarães 2012, they propose an idea to merge two creative methodologies, Architecture & Hairstyle. Where you least expect are sometimes created the most peculiar ideas.